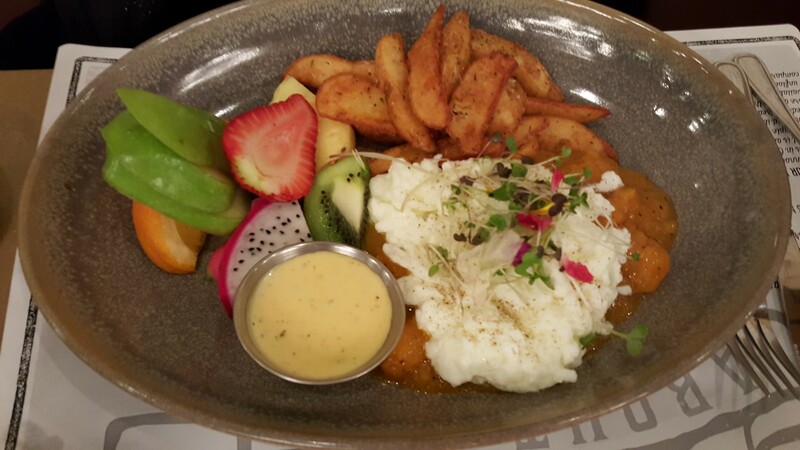 A delicious breakfast presents fewer difficulties, than other meals, when it comes to sourcing local ingredients. 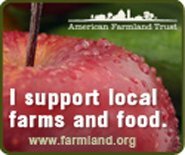 The fundamental building blocks of diner-style breakfast food — eggs, meats, and dairy products— are agricultural products more readily procured in a sustainable and ethical manner from local purveyors even in a northern climate. 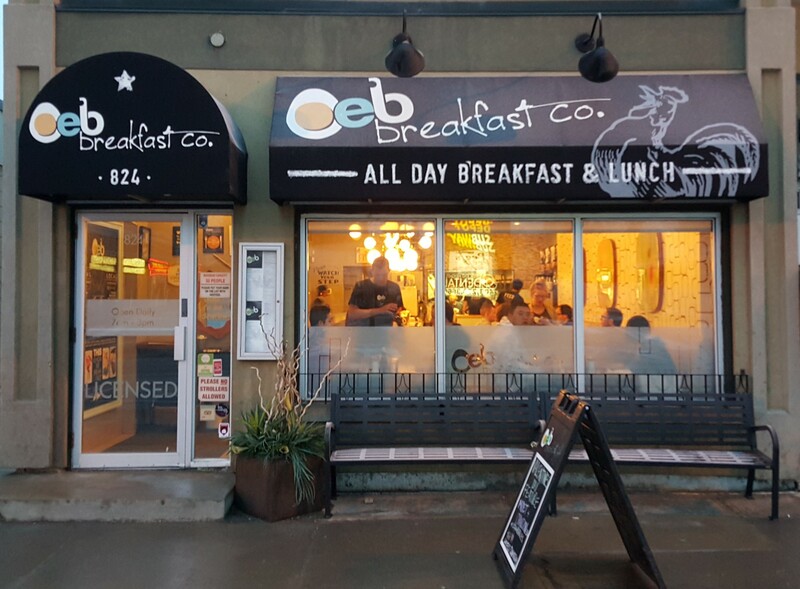 Moreover, in the midst of Canada’s wheat belt, where Calgary’s OEB breakfast co. is located, pastries and breads can be made with locally sourced, organic flour milled from wheat grown on Alberta’s plains. According to owner Mauro Martina, OEB uses organic, unbleached all-purpose flour, made from Alberta-grown hard red spring wheat when possible and preferably from Highwood Crossing. Rolling up to the warm, inviting space occupied by OEB on Calgary’s north side was a pleasure on the cool, snowy, dark, and foggy morning we spent in Calgary (where in early February the sun doesn’t rise until almost 8 a.m. and the warm Chinook wind blowing down the mountains creates a dense early-morning fog when it comes in contact with the snow-chilled surface). 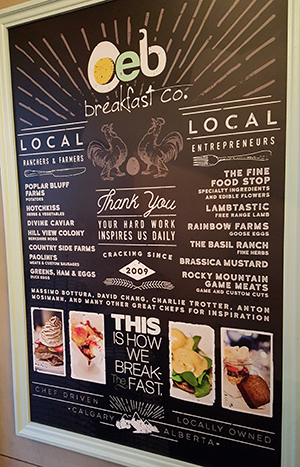 Just inside the doorway is a sign announcing the local ranchers, farmers, and entrepreneurs who provide a large portion of OEB’s raw ingredients. The sign shares thanks with a thoughtful message to these suppliers: your hard work inspires us daily. 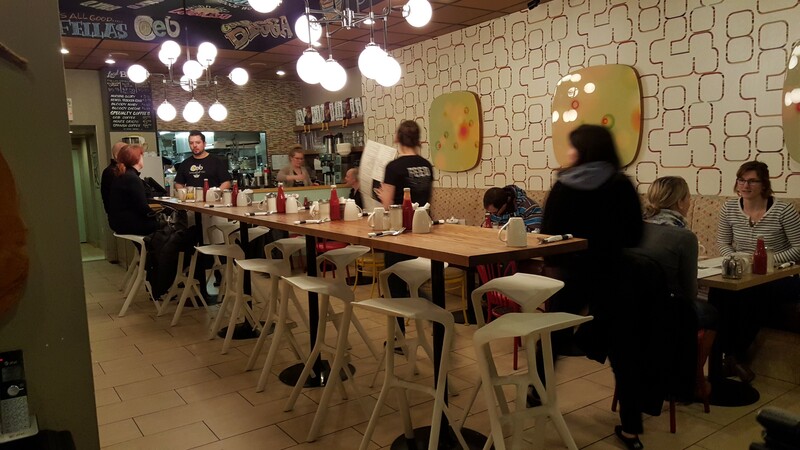 The restaurant is decorated in a fun, peppy mid-century mod style that pays updated homage to diners of yesteryear. Upbeat soul and Motown music playing through the sound system added to the joyful vintage vibe. At the early and dark hour we were seated, both the staff (upbeat, all) and we diners were still waking up; the massive front-and-back menu we were given to choose from presented an intellectual challenge. Every dish on the menu was independently appealing. The menu ranges from standard breakfast fare (waffles, french toast, smoothies, basic egg/meat dishes) to the more elaborate dishes we ordered from the My Blue Plate Special part of the menu. One diner ordered the braised truffled butternut squash with scrambled egg whites, which the kitchen happily substituted in place of the standard two poached eggs. The dish included a truffled squash compote, the restaurant’s standard twice-fried potatoes (fried in organic duck fat), fresh fruit (decidedly non-local, as one would expect given the winter season – the fruit included dragonfruit, more common than you’d expect as a result of the Asian-inspired culinary scene of Western Canada, and kiwi), a brown butter hollaindaise, and microgreens. The dish was excellent; sweet and savory all at once, and filling without being heavy. The potatoes, given the use of duck fat for shortening, had a rich and complex flavor. The second diner ordered the Wild Boar Spalla, an almost overwhelming dish for this early in the day. Two thick and large pieces of soft and delicious brioche bread were topped with two hen eggs cooked over medium, six month cured wild boar shoulder charcuterie, arugula, finely grated manchego, and a smoked chipotle aioli dressing. This diner was perhaps a bit overzealous in his breakfast order decision-making, but the dish was just as delicious as it sounds. Wild boar charcuterie is a great pleasure as the meat can have unexpected and sweet flavors – this charcuterie was no exception. These dishes were priced at $14.99 and $15.99 CAD respectively (current exchange rate is $1.38 CAD = $1.00 USD), which seems quite inexpensive for the quality of the ingredients, preparation, and service, and the quantity of food presented. Our overall experience at OEB (originally called Over Easy Breakfast and renamed in honor of its customers’ preferred nomenclature) was excellent and on our flight out of Calgary we bemoaned our single opportunity to eat there. OEB – keep on crackin’! 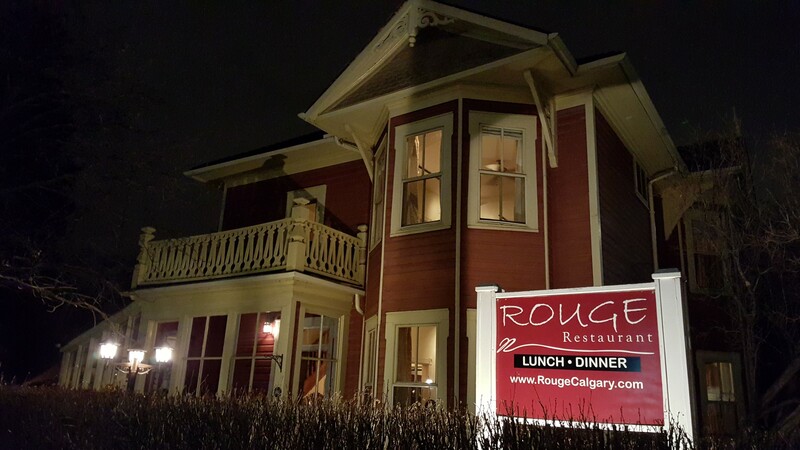 We also enjoyed a very fine farm to table dinner, filtered through French cooking technique and flavor, at the homey restaurant, aptly name Rouge, situated in a small, two-storied house (built in 1891 and which has always been painted red according to our server) in the middle of a residential neighborhood just east of downtown Calgary. We were greeted by a friendly hostess with a French accent – all staff epitomized the unhurried, garrulous, and friendly nature of other Albertans we met on our trip. Diners are distributed throughout several rooms, each with a handful of tables. We were seated in the house’s original dining room, which had windows looking out at the restaurant’s property. The room was decorated with paintings of the nearby Canadian Rocky Mountains. Between March and November, the restaurant takes advantage of its large property (which takes up 6 city lots) to grow a good amount of the produce used by the kitchen. There are a number of raised beds in the deep backyard where the restaurant grows all sorts of fresh ingredients for use in its dishes. It’s hard to beat a well-managed backyard garden in terms of local sourcing of ingredients. Out of season, the restaurant makes strong efforts to source local ingredients and places an emphasis on root vegetables, sustainably-sourced fish, locally-sourced meats, and complementary starches. 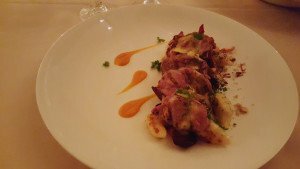 Diners can select a chef’s tasting menu “for the epicurean inspired by adventure and exceptional food,” $115 CAD per person with a recommended wine pairing ($60 CAD for the standard or $100 CAD for the premium pairings). For visitors from the United States, the advantageous exchange rate made the chef’s tasting menu tempting, but we opted instead to order off the á la carte menu. Our waiter first presented us with an amuse-bouche – a small puff pastry with an herbed cream cheese filling – a pleasing beginning to the meal. House-baked sourdough bread (made with locally-sourced, Highwood Crossing all-purpose and Heritage Harvest red fife flours, both organic) had a delicious sourness, indicative of a good starter or extended fermentation. The bread course included cultured salted butter and fermented butternut squash. A salad of salt-baked root vegetables accompanied by port-poached pear, hazelnut butter, pear-hazelnut dressing, and winter lettuces provided a delicious first course. Salt-baking is an ancient, although unusual and recently trendy preparation where the food is cooked in a layer of salt that locks in moisture and flavor and also seasons the food inside – our waiter described the process of cracking the root vegetables out of their salt shell after baking. This preparation gave the root vegetables (primarily beets) an even, saline flavor that was pleasing in a dense, but not overwhelming, way. The poached pear and pear dressing provided a sweet compliment to the savory vegetables. We ordered two entrées. The first diner ordered a lamb loin from Driview Farms, which came with lamb neck confit, root vegetables, gnocchi, hazelnuts, and béarnaise. 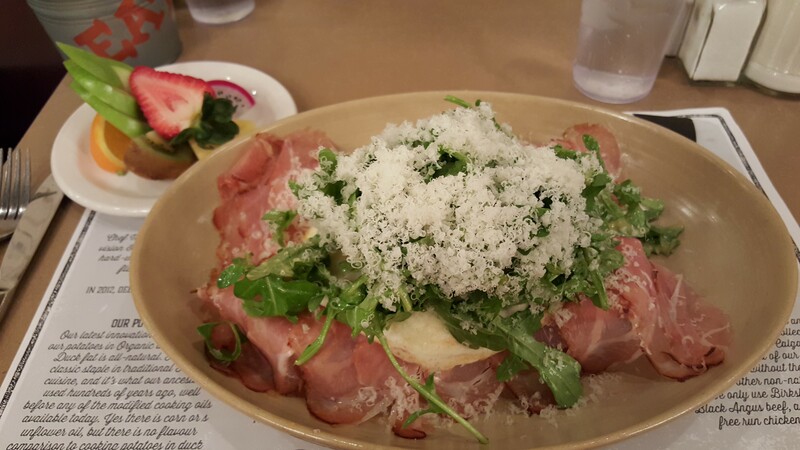 The dish was well balanced, and the gnocchi were especially delicious. 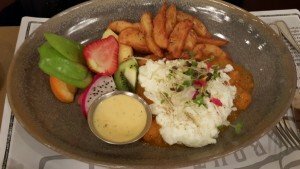 The second diner ordered a piece of Icelandic cod, recommended by the Vancouver Aquarium as an Ocean Wise fish, which indicates the seafood is considered to be ocean friendly. (This certification and its accompanying symbol is featured throughout menus in Alberta and British Columbia as a marker of sustainable fisheries, and many restaurants embrace serving seafood that is sustainably caught, as evaluated by this program.) The cod was served on top of mashed potatoes with some roasted sunchokes, cippolini onions, and fine waffled potato crisps. The cod was flaky and well flavored and the accompaniments added a hearty, and savory balance to the dish. Even in the wintry month of February, Rouge is well worth a visit. 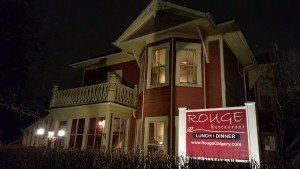 In season, when its backyard garden is providing ingredients for its French inspired menu, the fair weather tourist is in luck given the culinary skills, so ably demonstrated off-season, and Rouge’s friendly and attentive wait staff.